HX-DMXBM-3CH, adopt the advanced micro control unit, it can receive the DMX-512 standard digital control signal which is internationally widely used. It changes the signal into PWM control signal to actuate the LED lamp. It can also connect the DMX digital master to change the light color or dynamic effect. In addition, when the decoder is not connected with the DMX master, it can be used as a synchronous controller. That is to say you can synchronously control number of decoders with LED lights. ●The DMXBM-3CH is constant voltage decoder, accept international popular DMX512 standard digital control signal, convert it to the PWM signal to drive LED lamps, applicable to a variety of constant voltage LED lamps, such as RGB LED module, lights, string lights, etc. ●DMX decoder can be controlled by DMX master, and the decoder can connect the signal line to continue to expand the channels up to 512, eventually be able to achieve more change in effect. 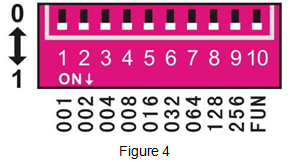 ●Except the manual-setting address by DIP switch, it is also can be assigned address automatically, when all the decoders' DIP switch are all "0". ●If no master, it also can be used as synchronized controller, all of them can synchronize work as a sync-work-system when connected by RJ45. ●When used alone, it also can be used as a normal RGB controller, with 9 modes in total. ●In order to achieve synchronization of more LED lamps, RGB amplifier can be used. ●There channels for RGB output, each allows a maximum current of 4A. This product is in compliance with DMX512 protocol, and compatible autoindex addressing and manual establishment address. 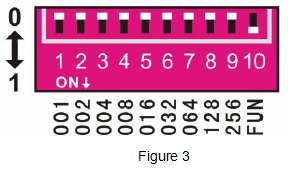 Like figure 1, to set up the DMX starting address code for 37, should move down the 6th, 3th, 1st bit for "1", others for "0". Then the placevalue's sum of 1st to 9th bit is 32+4+1, as is for 37. Like figure 2, to set up the DMX starting address code for 328, should move down the 9th, 7th, 4th bit for "1", others for "0". Then the placevalue's sum of 1st to 9th bit is 256+64+8, as is for 328.
indicator (green) blinks slowly, it runs the built-in program effectiveness of decoder. When the decoder receives the DMX signal, signal indicator will flash rapidly.